Shaun Currie’s parents learned last month that their four-year-old son was suffering from a terminal brain tumor. The little Scottish boy has spent the past few days in Yorkhill Children’s Hospital, in Glasgow, and the nearby Beatson cancer center. Shaun’s parents first realized something was wrong with Shaun when he felt poorly and became unsteady on his feet. His doctor sent him to the hospital, where he was diagnosed with a brain infection and scheduled for further scans. The seriousness of his condition was then revealed. 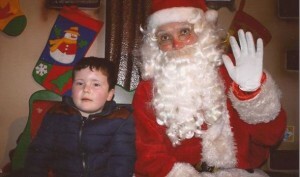 Shaun is due to start radiotherapy before Christmas but the effort to beat the tumour has already left him exhausted. It is affecting his speech and balance and he might need a wheelchair soon. Despite the sad prediction that Shaun is unlikely to see his fifth birthday in April, his mother Elaine and father Bruce are desperately seeking a treatment to buy the family more time together and launched a fundraising campaign. They are currently waiting to hear back from a clinic in the United States that offers proton therapy, a state-of-the-art type of radiation therapy: “People have already been very generous and we really do want to get any help we can, even if it means going abroad. We’ve been in touch with a clinic in the USA and are hoping to hear back soon. But we are too scared to hope too much”, they said. Friends of the family started a fundraising campaign immediately after Shaun’s diagnosis on November 21. The plan is to give the family as many memories together as possible, including a holiday to Legoland, before he becomes too ill to travel.